Preparing your favorite omelet for breakfast, lunch, or dinner has never been easier. 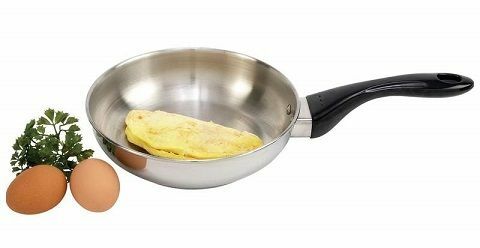 The Precise Heat' 8 1/4' 12-Element T304 Stainless Steel Omelet Pan is the perfect combination of design and functionality. This Precise Heat' skillet features 12-element T304 stainless steel construction and heavy-duty, riveted phenolic handle. Mirror finish exterior. Limited lifetime warranty. White box.